This is officially my new holy grail product when I'm looking for my skin but better. The coverage is very light, but on good days when I don't have ridiculous breakout, it works perfectly. 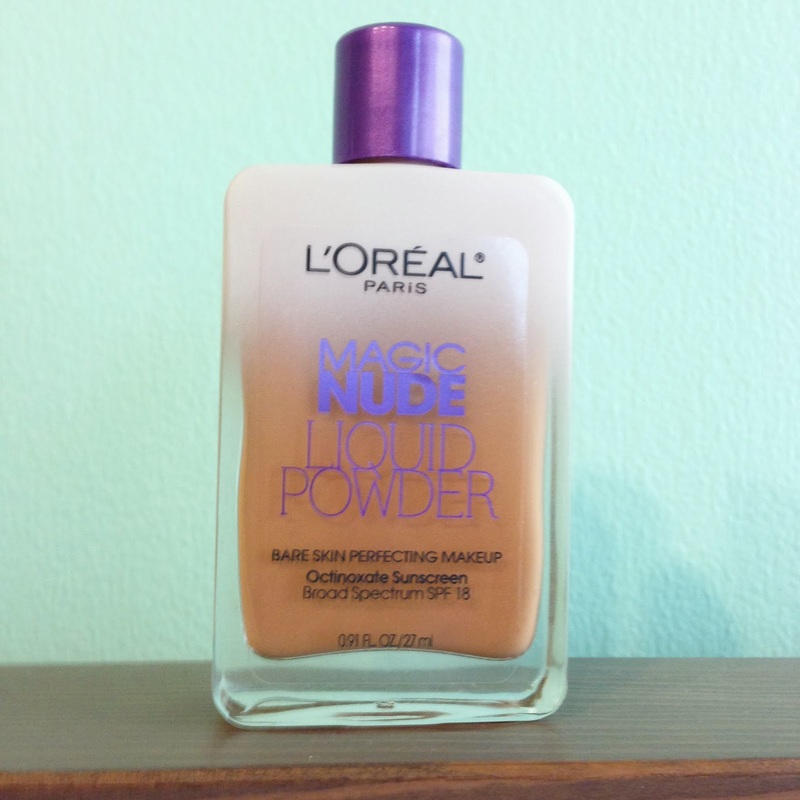 This is L'Oreal's new liquid to powder foundation with SPF that retails for about $12.99. While it is on the slightly pricier side and definitely not made for everyone, if your skin is like mine, it may be worth a trial run. First of all the packaging is horrible. It is the small glass bottle roughly the size of a credit card. And no you did not read that wrong, this is a drug store product that they decided to class up by using glass. This just makes me think of horrible scenarios that could happen if I ever took this bugger travelling and if it should break. The formula is also very runny and liquid, I pour it onto my wrist to apply but you need to move fast because it will run right off and drip everywhere. I feel putting the product into a bottle with a pump would work much better because you could pump it directly onto an applicator and save on the mess. The directions on the bottle says that it applies best with hands, but after experimenting on different techniques, I find that pouring out a bit onto my wrist and then applying it with a dry makeup sponge in smooth strokes worked the best for me. Do not buff this stuff in, you will end up with a streaky mess, just pressing it lightly onto your skin and using downward strokes will result in a light and even face. Let it sit on your face for a few minutes before passing judgement because the liquid to powder transition leaves your face looking comically powdery and slightly cakey however it does dry to a smooth satin finish and no one will even be able to tell that you are wearing makeup. With my combination skin this foundation lasted pretty well, there's no need to set it with a powder, I found no difference in the long-wearingness of it by doing so, and it kept me fairly matte all day. This foundation is fairly light coverage, it works best with skin that is already smooth and blemish free. It works well to cover any redness and slight discoloration to even out skin tone. It feels very lightweight and I swear people won't even be able to tell you're wearing makeup. The best thing about this foundation is that I was able to find a color that actually matches my skin color. Typically I have tan skin with yellow undertones but most drugstore foundation, the tanner colors have red undertones so those always make me look sunburnt. With this I find I am a perfect match for number 328 Sun Beige!